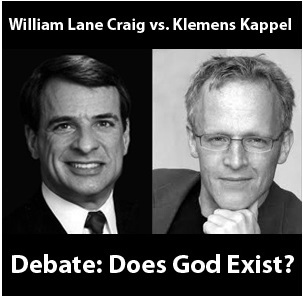 In the debate between Craig vs. Kappel on the topic “Does God Exist” the question “Why should we believe atheism is true?” comes up.Kappel is unable to explain why anyone should believe in atheism while Craig provides 6 reasons right off the bat while theism is true. A. Dr. Craig concludes Theism or “the God hypothesis” as he put it earlier – is “perfectly rational to hold to” – which is of course the theme of this site. 2) You’ll note I’ve had occasion to discuss item number 2 in a couple of posts1 since a number of those who claim Christians argue “illogically” seem to be unaware of this concept. Here is yet another confirmation that this is a standard logical concept accepted by atheists and theists alike. This entry was posted in Apologetics, Atheism, Faith, Logic, Philosophy, Rational Thought, Reason and tagged Klemens Kappel, William Lane Craig by Duane Caldwell. Bookmark the permalink.